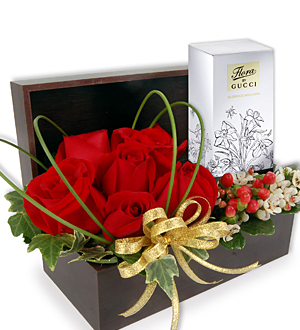 Sweeten her day with a lovely floral-juicy fragrant from Gucci and romantic Red Roses. GUCCI Flora by Gucci Garden - Gracious Mandarin EDT 50ml imparts euphoria and captures the exhilaration of the gloriously juicy fruit with this exuberant expression of effusive energy. Notes include Mandarin, Pina Colada Accord, Jasmine, Creamy Wood and White Musk.